Hydrangea 'Let's Dance Moonlight ' PPAF, Common Name: Big Leaf Hydrangea. LETS DANCE is a new series that represents the next generation of reblooming hydrangea! These floriferous varieties bloom on both new wood and old, which creates an incredible display of color. 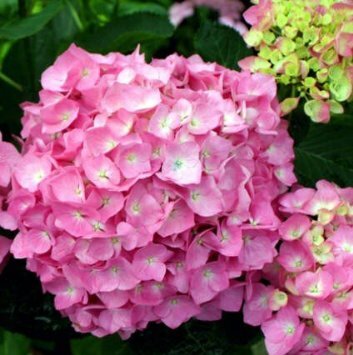 Hydrangea LET'S DANCE Moonlight is strong rebloomer with large, rich rose-pink (or blue depending upon pH) mophead flowers that are held on sturdy stems. Moonlight has a wonderful compact habit, growing to only 2-3 feet tall. In autumn, the healthy foliage takes on rich bronze red tones for additional interest late in the season. Primary Color: Deep Pink/Rose. USDA Hardiness Zone 5-10. Height: 2-3 Feet. Spread: 3 Feet. The plant you will recieve is growing bare root 6-12'' Prefers Full Sun. Height: 24-36". Immediate shipping.